Bowhead whales in Alaska's Arctic waters appear to be thriving even as sea ice shrinks, offering a counterpoint to climate-change concerns that have prompted federal threatened status for some other northern animals such as polar bears. "Multiple lines of evidence all point to the Alaska (bowhead) stock doing really well," said Craig George, senior wildlife biologist for the North Slope Borough, on Wednesday. Temperatures in the Arctic have risen faster than anywhere else in the world, creating more open water that is apparently improving conditions for the tiny krill and other crustaceans the bowheads eat, scientists said. Alaska's bowhead abundance appears to still be rising after decades of growth, while calf production is especially strong, they said. "One of the best indicators of overall health of the herd is good calf production and we're sure seeing that," said George, a longtime bowhead expert from Utqiagvik, the nation's northernmost community. Records show the whales are also fatter than they were about 30 years ago, with full stomachs in fall and low disease rates, George said. Climate change has complicated life for subsistence whalers and hunters, who worry about animals' changing migration patterns and the deadly risks of traveling on thinner ice, said longtime Utqiagvik whaler Billy Adams, 52. But the bowheads are doing well, he said. In the 1980s, a decade of heavy sea ice, bowheads generally migrated past Alaska's northern coasts in September and October after leaving Canadian waters, Adams said. Now, the migration starts in August and continues until the last few whales travel past in late November. 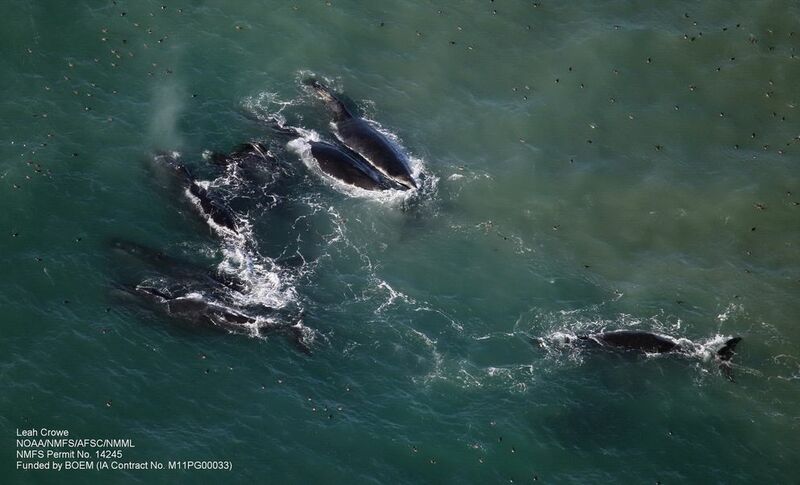 "That tells you there's a large increase in the population number of bowhead whales," said Adams, also an employee with the borough's wildlife department. "And they are lot fatter than what they used to be in the 1980s." Alaska's bowheads, once decimated by commercial whaling that ended about a century ago, reached 17,000 during the last population count in 2011. The animals often travel beneath sea ice, ranging between Russia and Canada, with massive heads for ramming openings in ice and a foot-thick layer of insulating blubber. With less ice, more sunlight is entering the water, and more wind is mixing up the ocean, creating conditions that appear to be boosting the bowhead's food supply, George said. Storms sweeping across open water, a growing threat for many Alaska villages once protected by coastal sea ice, may be helping swirl nutrients. Megan Ferguson, a scientist with National Marine Fisheries Service who runs the aerial survey program for Arctic marine mammals, said observers in 2016 and 2017 have seen huge groups of whales feeding off the mouths of Alaska rivers in summer. The size of the aggregations is unprecedented, at least for Alaska waters, she said. For four days in August 2016, surveyors detected a massive group of 600 bowheads feeding near the mouth of the Colville River, one-third of all the bowheads spotted that year, she said. That's many times larger than any previous single group counted by the agency. A surveyor on that plane, Amy Willoughby with NMFS, said she was struck by general "shock and awe" of seeing the "mythical" number of whales. She called the sight "unbelievable." The Colville flushed unusually large amounts of fresh water into salty Harrison Bay that summer, creating a zone rich with food where the animals can swiftly eat, Ferguson said. 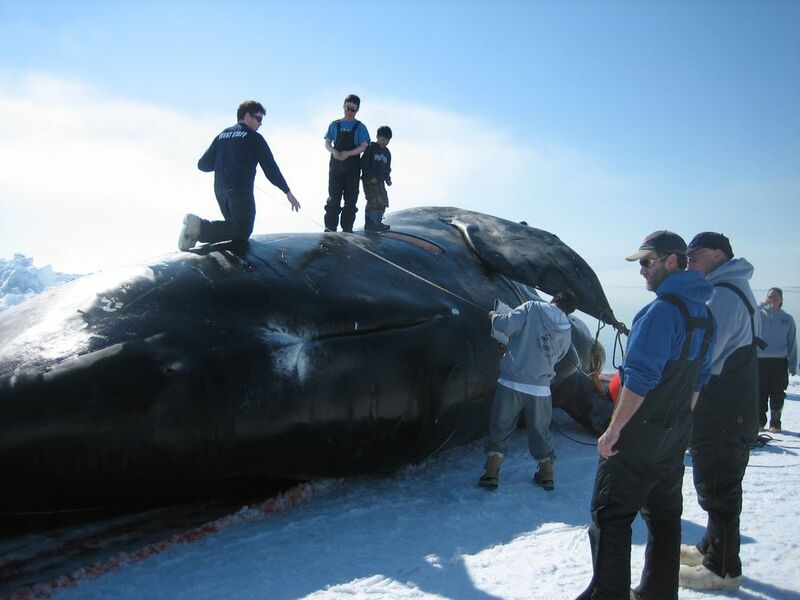 "That area was historically a bowhead whale desert for us," Ferguson said. "If you asked us where the most boring place in our study area to observe whales was, we'd say Harrison Bay." The agency doesn't have strong photos illustrating the giant whale gathering, she said. The team was "maxed out just just trying to record the data," she said. Surveyors' top priority is looking out windows and counting. They usually see partial body shots and splashes as whales feed. "We collect photos on an opportunistic basis," Ferguson said. The team came across another out-sized group of bowheads late last summer, this time in the Camden Bay area, further to the east and nearer the Canadian border, she said. Also "noteworthy" are the large number of calves spotted in some recent years, including an extremely high number in 2017, Ferguson said. That year, calves made up 12 percent of the overall number of whales detected. Since the late 1970s, satellite records tracked sea-ice loss at about 10 percent a decade, George said. 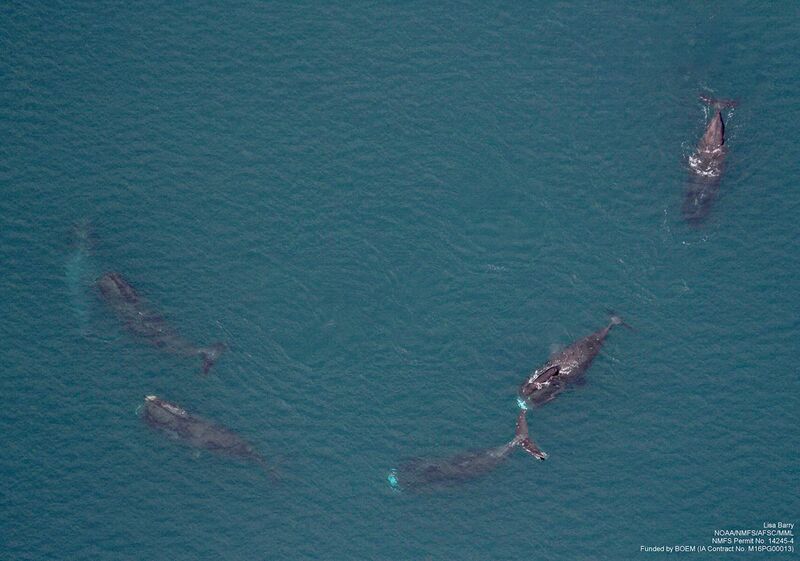 Meantime, bowhead abundance grew at a 3.7 percent annual clip through 2011. George said that abundance trend may have risen in recent years, based on the strong calf-production rates and other data. The next population count doesn't occur until 2021. A study led by George and published in 2015 focused on the girth of sub-adult whales, using the body measurements he and other scientists have collected for decades on the Slope, every time a whale is hauled ashore by subsistence crews. It showed the whales grew plumper between 1989 and 2011. How things will play out as sea ice continues to melt is anyone's guess, he said. The population won't keep rising forever. And the growth in girth may have leveled off in recent years, though a full analysis of that data is not complete, he said this week. Also, future threats from increased Arctic ship traffic, newly introduced diseases or other unexpected factors could suddenly alter the picture. "It's hard to say where this is all headed, but it's safe to say there won't be a textbook response like we learned about in wildlife biology," he said.